Sometimes you stumble across a portfolio where the artist only has a couple of comic based pieces, other times there can be one work so brilliant, you'd risk being stoned to death by fellow art lovers for putting something else beside it. 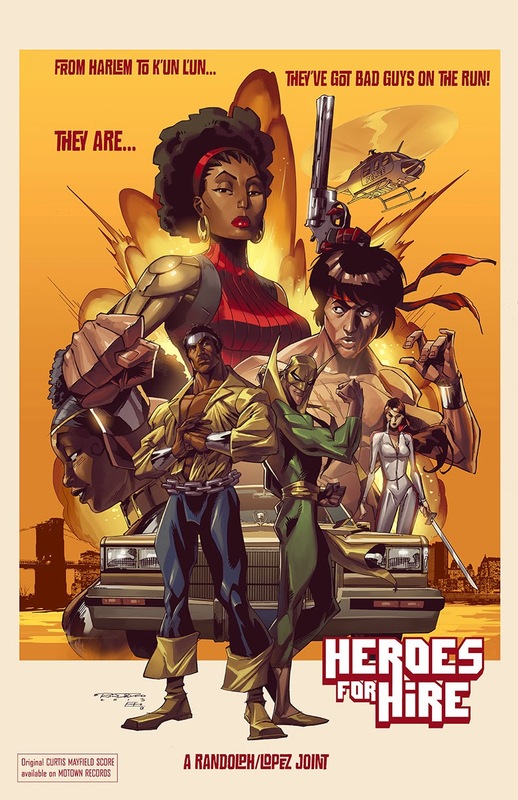 These are Random Works of Wow and illustrating the point this week is Khary Randolph, with his frequent artistic partner Emilio J.Lopez, illustrating their dream project - a relaunch of Marvel's Heroes For Hire. Over the years Heroes has had all kinds of different line-ups, from the Hulk / Black Knight era to the recently ended 'Misty Knight super-hero call centre' style, but the founding combo of Luke Cage - Power Man and Iron Fist has never been beaten. Add in Shang-Chi Master of Kung-Fu, Misty Knight plus that pulp movie feel, and forget it, Marvel would have a new #1 title in a heartbeat. With Cage and Danny both getting their own Netflix TV series, and Iron Fist getting a mean new ongoing comic, this revamp could easily be on the cards at Disney already - hopefully still with enough time to get these two onboard. To get more of Khary and Emilio's latest art, watch for Tech Jacket from Image Comics!